Here is my rain garden. 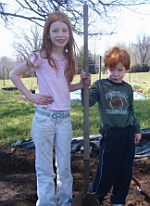 My children and I began digging our rain garden this April between the spring showers and thunderstorms. Our land slopes down toward the street so we have to dig down 6 to 8 inches on the uphill side close to our house, while piling the dirt as a birm on the downhill side. 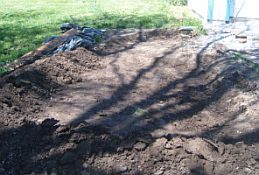 I began digging at the end of my downspout creating a wide bed to funnel rain water down into the basin of my garden which is about 8 feet wide and the requisite ten feet from my home. I enlisted my children to stamp the birm down into place so that it wouldn't wash away in torrential rains. Even without my plants installed I can already tell that my front lawn doesn't get near as spongy or muddy anymore. I still have more digging to do to get my basin leveled out just right. I'll get a picture of the empty basin when I'm done. Well, we've dug our garden here and now it just looks like an empty hole. 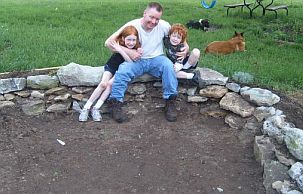 As you can see we dug a channel down from the downspout of our home and then dug a wider basin for the actual garden. ALong the right side is our driveway and the left it our yard. Rain would run down into our yard and out toward a very large oak tree in our front yard. The yard then would turn into mush. It was very hard to walk in without getting your feet wet. We're excitedly awaiting our wildflowers to plant and we also plan on getting a bridge so we can get to the other side of our yard without walking through the garden or all the way around. Heavy rains for the past few days have already proven the usefullness of our whole in the ground. All of the water from out roof has been captured in the basin. Our rain garden is coming along and looking less like a hole and more like a pond. My husband had the idea to shore up the birm with rock. Missouri is riddled with caves and you can often find limestone and flint laying along the sides of the road. So we went prospecting for rock, a trip my children thoroughly enjoyed. Then we began layering rock up along the birm about four layers deep. 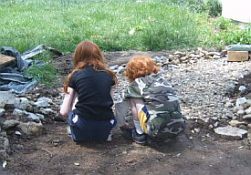 My children enjoyed placing rocks as well. They very carefully chose their peices and placed them so neatly in their appropriate places, so this has indeed become a family project. We have chosen all of our rock, picked it up of the road actually. In our rain garden we've chosen a mixture of limestone and flint. My husband prefers the look of the limestone so he made sure that particular rock was toward the top. As you can see from the picture we have a lovely layered rock garden backing the bowl of our raingarden. Along the outer birm we planted ground cover to help hold down the dirt along the back. And now we are ready for our plants, which should look beautiful growing in around all of our rock. We decided to wait for a good rainfall to see how our garden is going to work for us. And rain it did. Buckets and buckets. 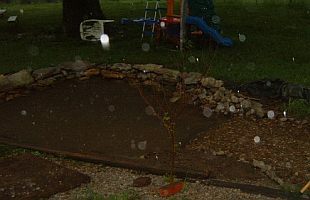 From this picture you can see the rain has been funneled nicely down from our downspot, across the rock path and into the bowl of the garden. Now there is 4 to 6 inches of water in the garden. Conclusion being. It works! It really works. Once the rain had stopped this water seeped into the ground in less than two hours. The other great thing about this little event was that we could see where we needed to add more rock due to washing. Now we are ready for some plants! I ordered some native plants from one of the local nurseries here in Missouri. I planted a couple of sages, a shrub and several wildflowers, including my favorite Cardinal flower. Since it was my daugher's birthday we had a plating party with several of her friends. 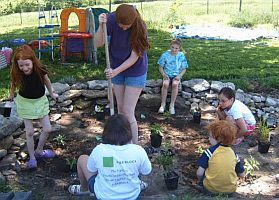 It was fun and the girls enjoyed planting. When we were done we mulched around the new plants. Unfortunately that turned out to be a big mistake. With the next spring rain the mulch floated up and over the top of the new flowers. We lost a couple because of that. I wouldn't mulch a rain garden again. It probably would be best to use compost or pea gravel until the plants grow in thick enough to keep out the weeds.